This is an almost one pot meal - it all cooks in the skillet after the pasta boils in a pot. Two pots though, that's still a pretty easy cleanup! I used the Skillet Lasagna recipe that I recently made as inspiration. I mixed instead of layering, but everything else was pretty much the same. It took about 25 minutes to prep, and that includes the time to boil the water and cook the pasta. After that it goes into the oven for 20 minutes, giving you plenty of time to wash the one pot and then open a bottle of wine. Bring a pot of water to a boil; salt and then cook the pasta according to directions. Drain. Heat a large sauté pan (oven safe) over medium-high heat. Add the ground beef and cook, crumbling, until almost cooked through. Add the tomatoes, tomato sauce and red pepper flakes. Bring to a simmer for a few minutes. 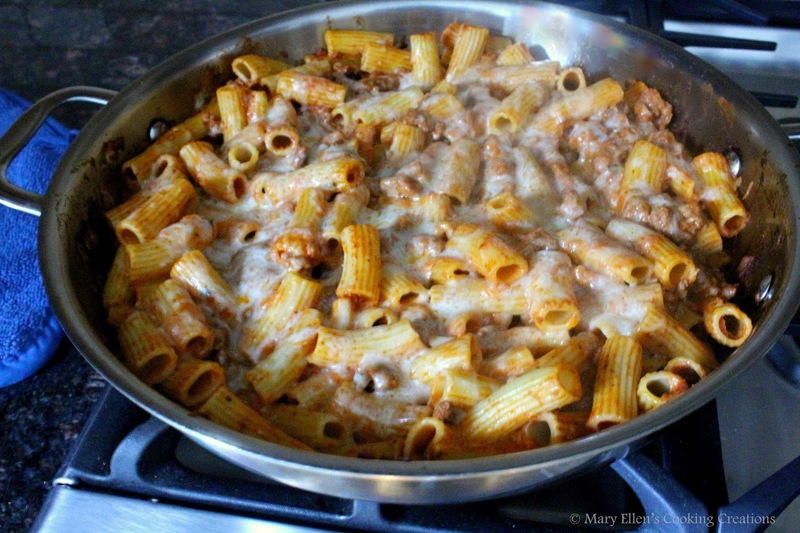 Remove half of the meat mixture (just to make it easier to mix without making a mess) and pour half of the cooked pasta to the skillet as well as half of the cheese mixture. Stir to coat. Add the rest of the meat, pasta, and cheese mixture; mix. Cover and bake on 400 degrees for 20 minutes.